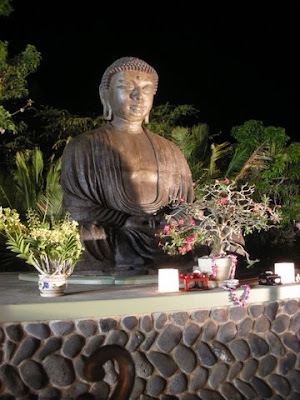 In May 2011, RLA supervised the conservation of Amida Buddha at the Jodo Mission in Lahaina, Maui. The largest bronze of its kind outside Japan, the 12 foot, 3 1/2-ton sculpture was cast in Kyoto, Japan between 1967-1968. The sculpture had been brazed and painted over the years, obscuring the original bronze surface. Carried out in conjunction with Michael Jones of Art Services Hawaii and University of Hawaii sculpture professor Linda Yamamoto, the treatment consisted of chemical paint stripping, removal of epoxy fills, cleaning, and spot repatination to specifications provided by the Lahaina Mission's Reverend Hara. The treatment was finished by the application of two coats of a proprietary paste wax to the heated metal surface, followed by a sacrificial coat of cold paste wax. Above and below: Art Service's Michael Jones removing the paint. The Buddha after treatment is complete, at opening ceremony.